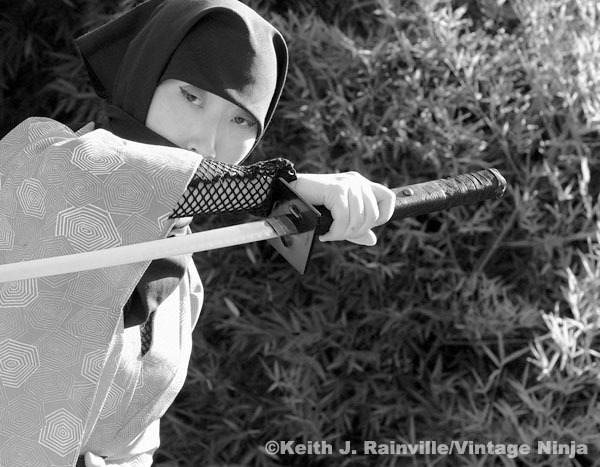 I had just enough knowledge of Japanese film and TV to have gained an affinity for the curved shorter blades with square guards, plus a real contempt for stuff like Asian World of Martial Arts‘ camouflage ninja sword. As the craze movies got cheesier I increasingly associated the regulation blade with everything wrong and frustrating about the genre. The craze waned concurrent with graduation and college, so stuff went into storage. In the mid 2000s I cracked open some of those long-stored and half-forgotten archives and was pleasantly surprised at what had survived. This is my original “Ninja Bokken” from Dolan’s Sports. This thing was bashed against trees, other wooden swords, Tim’s head, and my brother’s head (he had a more typical straight version that broke, HA!). It was taped-up white one winter, the blade was once painted silver to stand in for a real sword in some abandoned home movie plan, then it was stored away with a golf club tube as a sheath in a garbage bag that magically preserved it from the elements and a termite-infested basement. Amazingly it’s right as rain today, and I treasure this thing above any other piece I have. 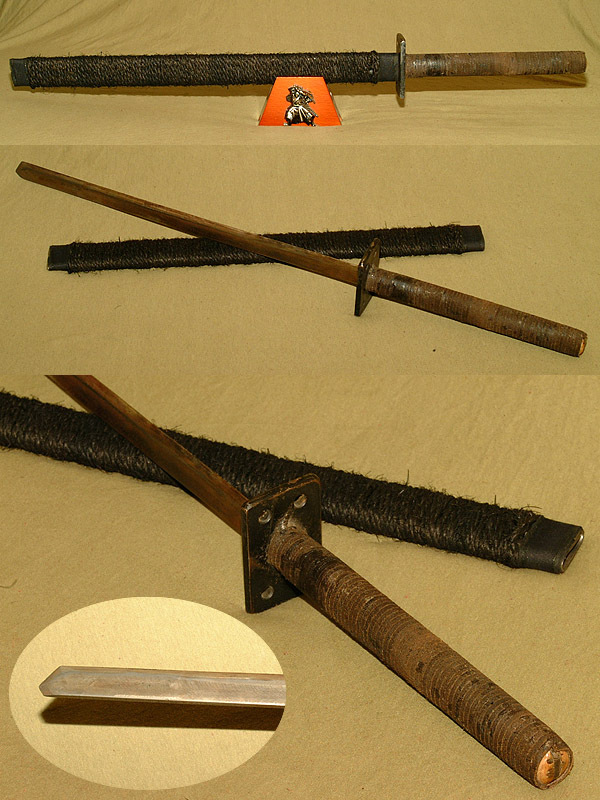 Another treasure didn’t fare as well in storage, but then it wasn’t that pretty to start with… a T.J. Craig ‘Real’ Ninja Sword. Tim and I sent a summer’s worth of saved and scrounged nickels and dimes to some obscure address in Canada for these after seeing the no-frills ad in Ninja or Black Belt. The sheath can break a brick! How could we not want that??? We had such romantic notions of this dealer – the low-brow ad with weird items next to all the other slick, photo-laden spreads with the same old crap month after month. To us, it wasn’t dodgy. It wasn’t cheap. It was code. This was the real stuff, hidden behind a primitive ad others with less insight would brush off. But we had a hunch we were on to something. This ad played a silent flute only we could hear! So off went $150 or so, Canadian. And we waited. And waited. And waited. Months later we got the local postmaster involved, and a few weeks after that, a rag-tag bundle showed up at my door. Elation turned to mild heartbreak. The execution of the swords was about as good as the ad. 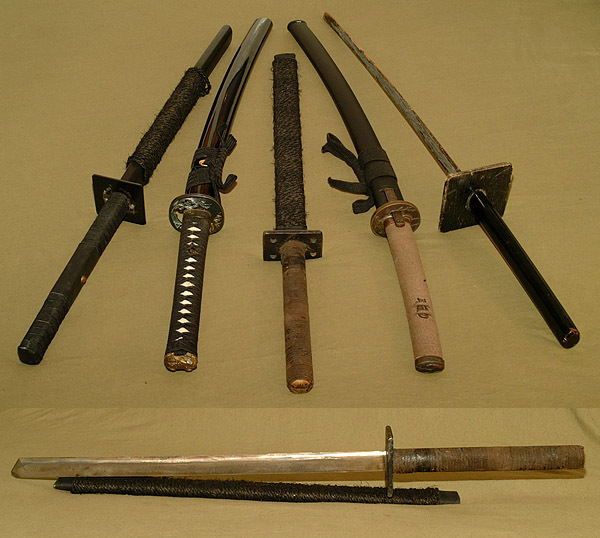 These truly were the storied ‘crudely ground slab of rough steel’ forged by impoverished ninja of legend. The chisel tips were useless. 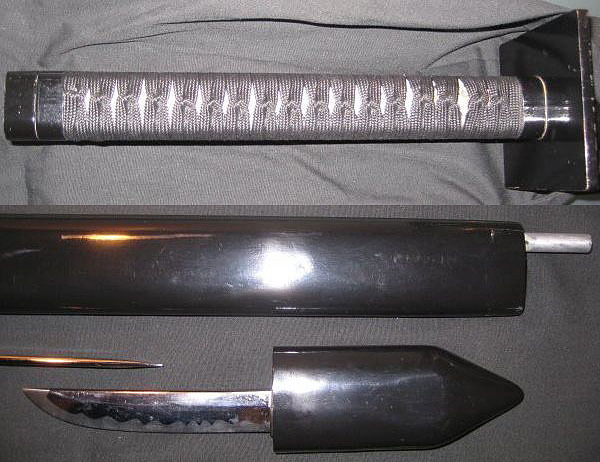 The sheaths were hastily folded and crimped steel, and scraped the blades loudly with every draw – hardly the stealth weapon. 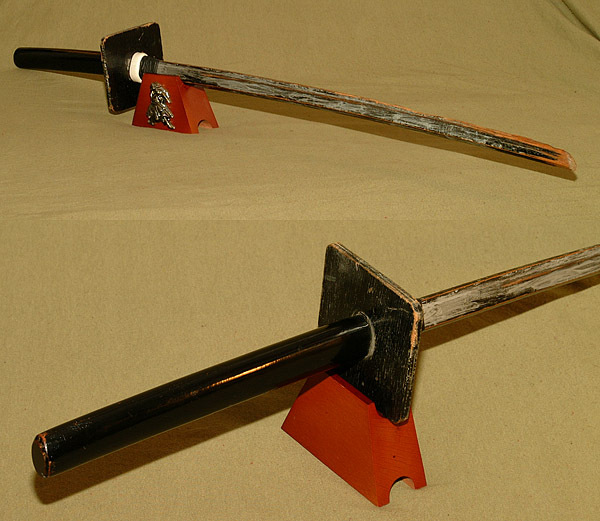 The handles were barely-finished wood with acute square edges, splinters abounding. Nothing had been misrepresented, but no triumphant ‘See, we knew it! Told ya so world!’ was going down either. 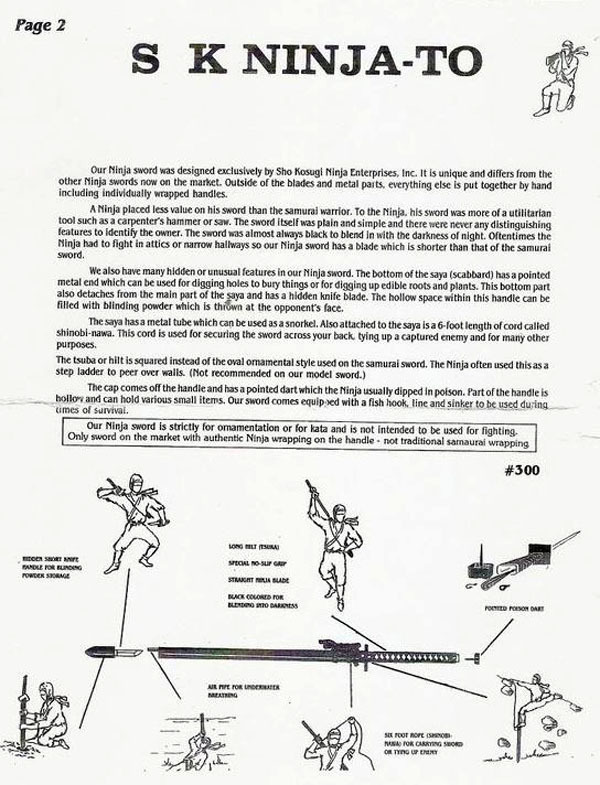 We hated these things, and ourselves, and wondered if our money would have been better spent on the “Ninja Hand Cannon” or “Assassin Cloaks” but what was done was done. Every few years, we’d independently break these out and do some more cosmetic work. Tim ground the handles down to round. He got his blade pretty damn sharp if memory serves. I learned the hard way that hockey stick tape has surprisingly little shock-absorbing properties, so I added some cord-wrapping to mine. Gave it a rustic feel, as did wrapping the sheath in 50 feet of black rope. Times cures wounded pride and squandered funds, and with my current perspective, I look at this survivor (albeit a bit rusty, but nothing steel wool won’t take care of) with warm nostalgia. I’m no swordsmith or craftsman of any skill, but I dabble and experiment once in a while. 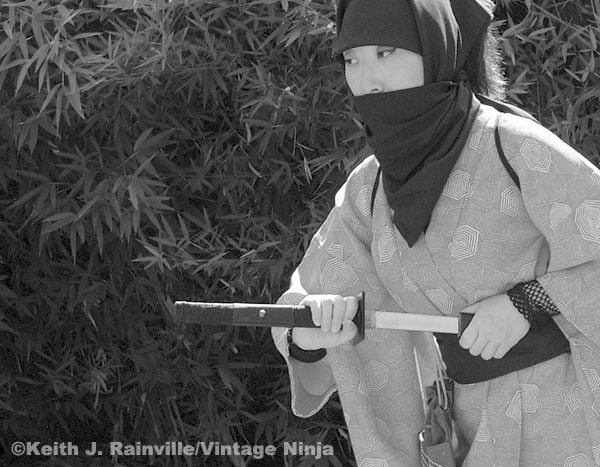 This is a prop I made in 2004 for a photo shoot for the old Ninja80 site, deliberately fashioned to look like a 60s Japanese movie sword. 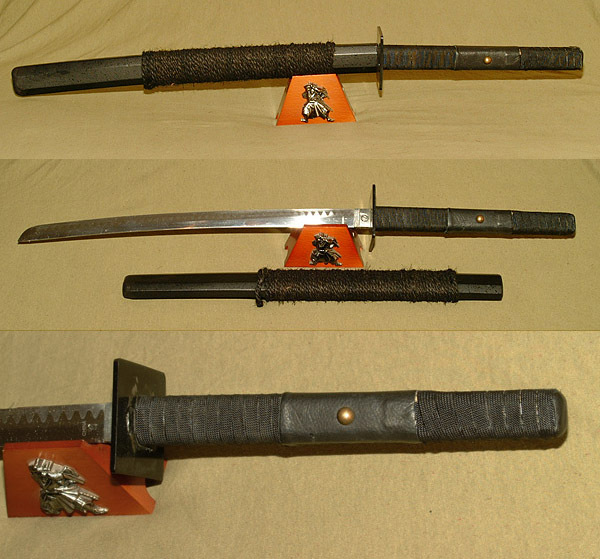 Started out with a knock-off “practical full-tang” wakizashi from either BudK or a shop in Chinatown, elongated the handle, slapped some leftover cord and leather remnants on there one night, and got what stage prop guys call “good from afar, far from good” results. Looked OK – and definitley not off-the-rack – in the pics though, and that’s what counted. Custom ordered these last year from an eBay sword shop out of Hong Kong that is either defunct or changed their name. (There’s a few other sellers with the same goods now.) 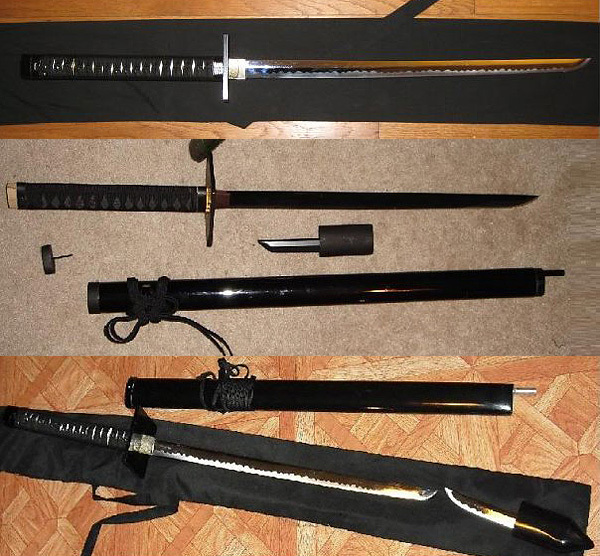 Nice thing was they let me get katana handles on wakizashi blades, and had a variety of wrappings and fixtures. 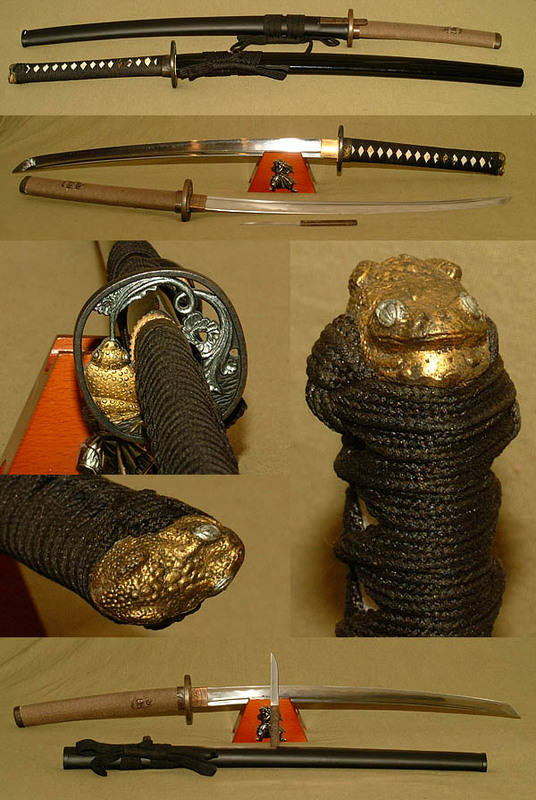 I love the brown twine handle, and while I dislike ornate gold stuff, they had a set-up that was toad themed, 50s ninja wizard style! 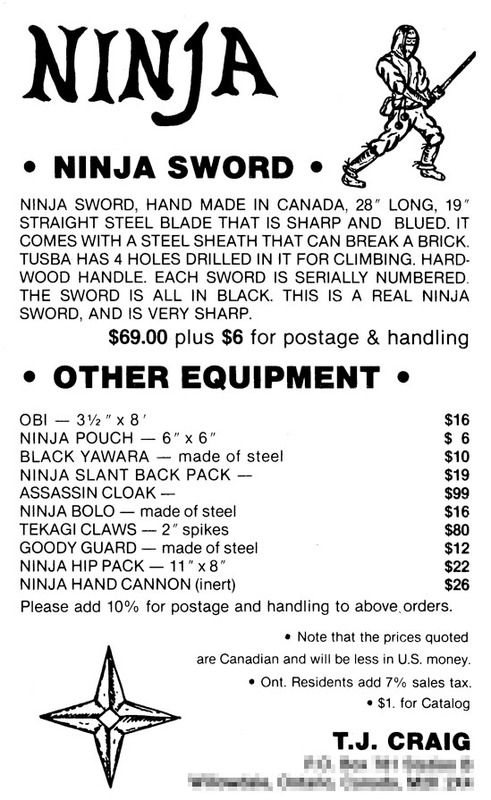 So with this array of non-stereotypical “ninja swords” in hand, do I regret a hole in the collection? 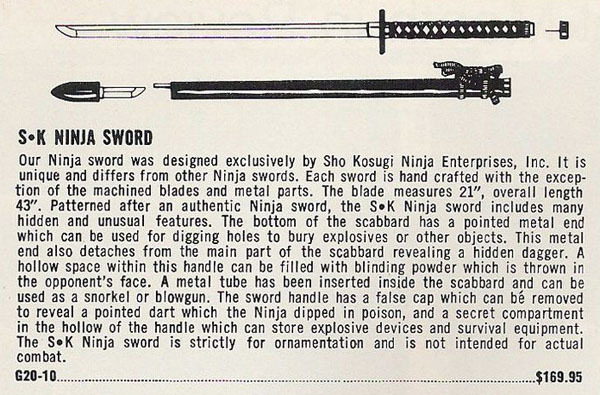 This is the OFFICIAL “S-K Ninja Sword” sold by Sho Kosugi Ninja Enterprises, Inc. There’s a real chicken-and-egg relationship between his fealty to this style blade on screen and the sale of a merchandised version off. These gimmicked blades, possibly in a variety of metals and finishes, were sold out of a mail order house and official fan club newsletter in San Gabriel, California. Maybe the only thing I’d want more than this is the TOY version! Next time, we wrap all this sword talk up with one final thought – has the research (and responses) lead to more questions than answers? I always been a lurker of this site, I enjoy every post from here!!! I was in my childhood/entering teenage on 80’s, and lived the craze with all my heart. Actually, my passion i still alive. The only thing I regret was to buy Ashida Kim books, should have read more… well, other stuff on those times, since there was no internet. But damn it!!! 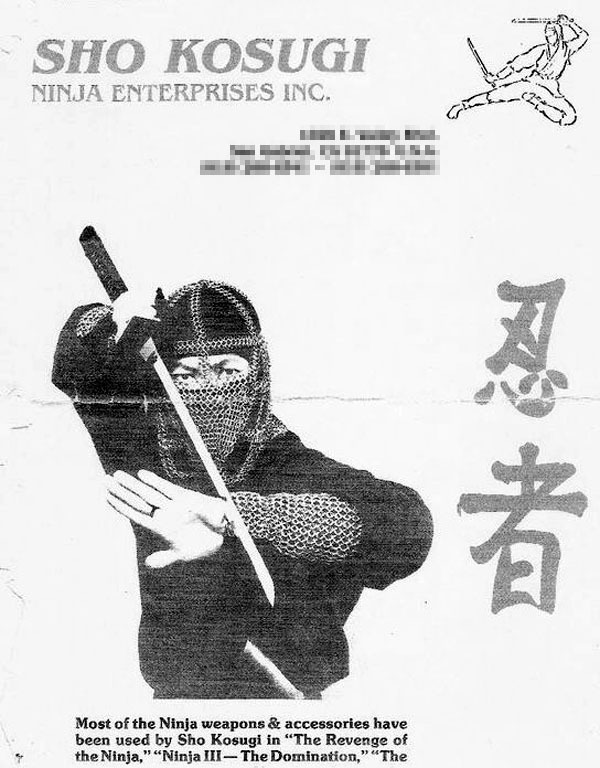 The straight ninja-to from 80’s have such an appeal!!! I crafted a lot of wooden replicas back on the day!!!! Well, good work, keep up this ninja site running!!! 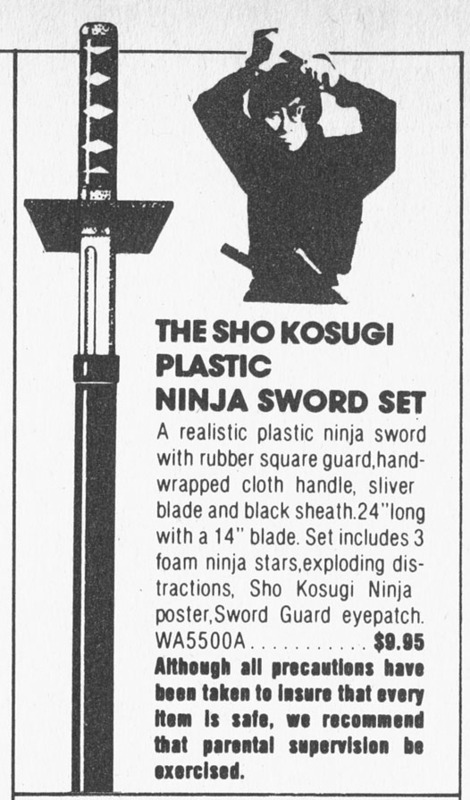 Joseph, very interested for an original SK ninjato….Any price. uniform. Dang that would be sweet to boot with an sk ninja to. Haha.